1) the abortive first attempt - which took place in 2002. 2) the second attempt - which took place in 2005, which totally captured me and drew me into pastels - a passion which continues to this day. In 2002 I first signed up to take a beginning drawing class, feeling my drawing skills were very poor and rusty. We mostly drew in that class, and I enjoyed the practice. Our teacher did introduce us to pastels when we tried working with color. And I both enjoyed it and hated it. I liked it as I liked working with color, and I liked the immediacy of pastels. But I *hated* everything I attempted. They all looks childish and hopelessly amateurish. And of course they were. But I realize now, in retrospect, that a lot of my frustration was due to my total lack of understanding about how to use pastels - and this was not taught in the class. 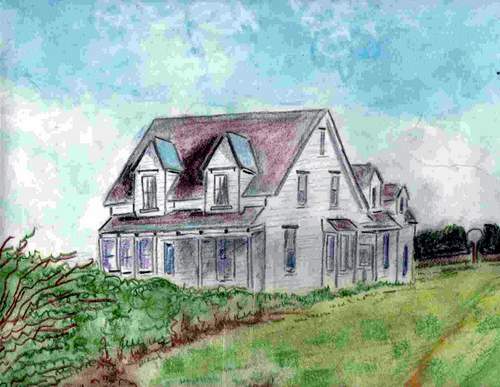 I wanted to learn to draw and color well, and I wanted to do a painting of our farmhouse, and I just had no clue what I was doing or how to accomplish it. 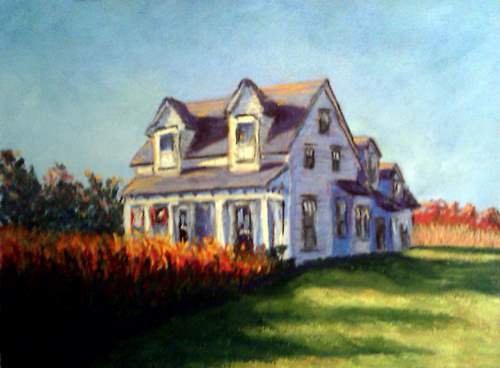 And the painting below is one I did of the farmhouse in that era - my first attempt. As you can tell it a very poor use of pastels. Only light single layers of colors, sketched on as if with a crayon or colored pencil. I hated it, so after that 2002 class I decided art was not for me and I gave up. But I still had a yearning for art, and in 2005 I signed up for another beginning drawing class, with a different teacher. She also introduced us to pastels when we did some color work, but this time I got some feedback on the *real* use of pastels - laying in multiple layers of color, using the sides of the pastels to put down swaths of color, rather than just the timid use of a tip. Suddenly I had fallen madly in love with pastels! I have taken classes continually since them and work on painting every week. The work I was turning out, while still clearly "beginnerish", was far and away a different caliber from what I had done in my 2002 class, and I was no longer totally embarrassed and ashamed by my work. So in that environment I decided to do another painting of the farm, which I did en plein air when up at the farmhouse for summer vacation. Large storm clouds rolled in as I worked and luckily I was close to the house as I had to grab all my stuff and race to the kitchen to escape the rain! But I was far happier with the attempt and felt it actually looked like a real painting, unlike the 2002 attempt. I liked it well enough that I found myself thinking that the farm was "done" - so no need to paint it again, except I still felt a yearning for it. So finally a couple years later I tried a different scene, the farmhouse in the early evening dusk. The perspective seems a little odd in this one though. The shed walls to the right seem to be marching uphill somehow, so it sort of spoils it for me, although I was happy with the sky, and the glow from the windows. But the farm is never truly done I guess, so I just recently made another attempt, now six years since I have been pasteling in earnest. This one was inspired by the lovely light and colors of the autumn that I saw when I was up at the farmhouse for a week in October this past year. This one is truly my favorite farm painting now. Will I still be saying that in a few more years if I continue to turn out additional paintings? Who knows?